Last year I started working at Nugent Hall, a housing community for the physically disabled, as a personal assistant helping the students with their activities of daily living. The Division of Disability Resources and Educational Services partnered with University of Illinois housing in 2010 to open a housing facility specifically for the physically disabled. I was interested and enthused to be able to get to know the residents as well as their physical disabilities. I grew particularly close to a specific resident of whom I work with the most. In order to understand him more I felt like it was my obligation to learn more about his disease. Therefore, the disease I am increasingly interested in is Muscular Dystrophy. I was eager to know, what exactly is Muscular Dystrophy? I decided to do some researching in order to understand the disease a little bit better. The first thing I did was type in Muscular Dystrophy in Google search and thought the definition would be a good place to start. According to Wikipedia, Muscular Dystrophy is a group of muscle diseases that weaken the musculoskeletal system and hinder locomotion. The disease causes progressive skeletal muscle weakness, defects in muscle proteins, and even the death of muscle cells and tissues. What was the cause of this disease? As I read on I learned that these conditions are usually inherited and different types of Muscular Dystrophies follow various inheritance patterns. I clicked on another link on Google search in order to find out more information. From Medline Plus I found out that Muscular Dystrophy refers to a group of more than 30 inherited disorders that cause muscle weakness and muscle loss. I did not know that Muscular Dystrophy was a group of diseases or that there were many different types. My train of thought was now focused on the differences between the different types. On the bottom of the page were links to more information about the disease. I decided to click on the first one under “Overview”. Once I clicked on it I found that it was a small article from the Journal of the American Medical Association that provided a limited amount of information. I learned that the three most common types of Muscular Dystrophy are Duchenne Muscular Dystrophy, Becker Muscular Dystrophy and Myotonic Dystrophy. I decided to focus specifically on Duchenne Muscular Dystrophy since this is the type that sparked my interest of the topic in the first place. I decided to go back to Wikipedia and read about the cause. I learned that the muscle skeletal cytoskeleton does not properly create the protein dystrophin and the expression of dystrophin-associated protein complex is reduced. 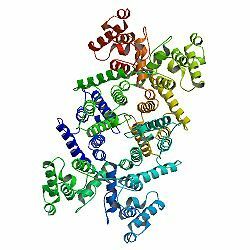 What exactly does the dystrophin protein do? Well, it is found in the membrane of a muscle fiber and its function is to join the membrane actin filaments. The presence of dystrophin is also necessary for the stability of the dystrophin-associated protein complex. I decided to find out a little bit more about dystrophin’s function and how the protein isn’t created correctly in the first place by clicking on its link on the Wikipedia page. by Derek J. Black et. al. 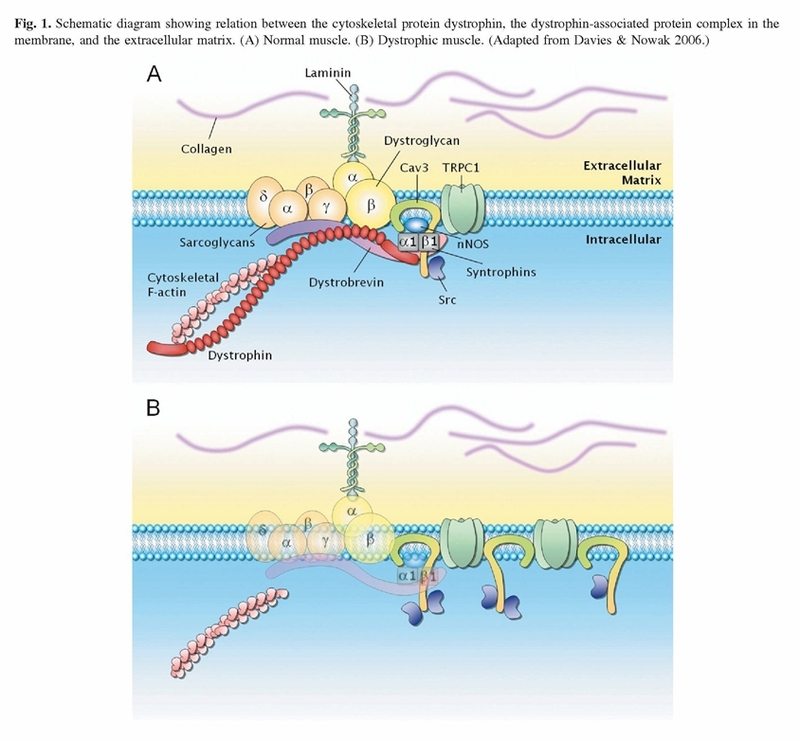 The authors stated something interesting in the abstract which is that although the precise function of dystrophin is unknown, the lack of protein causes membrane destabilization and the activation of multiple pathophysiological processes, many of which converge on alterations in intracellular calcium handling. When a muscle biopsy is taken on a person affected with Duchenne Muscular Dystophy (DMD) the muscle fiber isn’t that of a normal muscle fibers which are evenly spaced, angular, and relatively uniform in size. 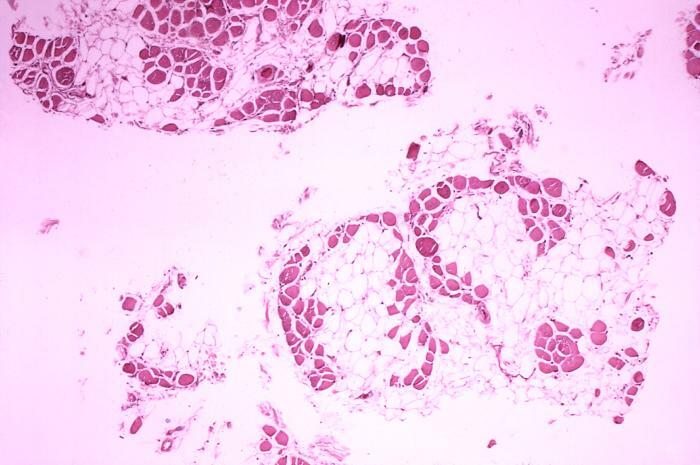 In postnatal muscle biopsies there are necrotic or degenerating muscle fibers which is often seen in clusters and usually confined to segments of the muscle fiber. The authors explain that, “Although there initially is active regeneration of the muscle fiber in order to repair or replace the damaged fibers this regenerative capacity eventually is lost and the muscle fibers are gradually replaced by adipose and fibrous connective tissue, giving rise to the clinical appearance of pseudohypertrophy followed by atrophy”. I wasn’t exactly sure what pseudohypertrophy and atrophy meant so I looked up the definition from a medical dictionary and found that pseudohypertropy is the increase at the site of an organ or part that is the result of an increase in the size or number of some other tissue (in this case is adipose and fibrous connective tissue) and atrophy is a diminution in the size of a cell, tissue, organ, or part. The combination of progressive fibrosis and muscle fiber loss results in muscle wasting and ultimately muscle weakness. Within the article the authors mention how dystrophin deficient animals such as mice, dogs, and cats (which arose by spontaneous mutation) play many important roles in the research into the functions of dystrophin. Specifically, the mdx mouse is useful because of the ease to which its genome can be manipulated. The mouse was discovered because of raised creatine kinase levels. Creatine Kinase is an enzyme that is released from damaged muscle. “Important abnormalities of dystrophin-deficient muscle cells have been demonstrated in three areas: calcium homeostasis, an increased susceptibility to oxidative toxins, and increased (and stress enhancable) membrane permeability.” Confirmation that the absence of dystrophin is indeed responsible for these abnormalities comes from experiments in which dystrophin has been restored. All of these abnormalities can cause pathophysiological processes leading to cell death and the symptoms of muscular dystrophy. In 1975 Mokri and Engel used electron microscopy to describe the ultrastructural features of DMD muscle (Mokri, B., Engel, A.G. (1975). They observed absent or disrupted sections in the sarcolemma overlying areas of abnormal cytoplasm. This observation gave rise to the theory that the primary pathology of DMB muscle might be an abnormal fragility and leakiness of the cell membrane. There is good evidence that a muscle that is dystrophin deficient is susceptible to increased permeability to macromolecules flowing in and out of the cell and is made worse by mechanical stress. DMD and mdx muscle contain an increased amount of fibers that stain positively for andogenous extracellular proteins such as albumin, IgG, and IgM. In a study conducted by Clarke et al. the triceps of mice were examined and 25% of fibers stained for albumin were found in the mdx muscle while only 4% were found in normal muscle. Calcium homeostasis is important to many aspects of muscle function, especially muscle contraction. There have been many suggestions that calcium homeostasis might be hindered in dystrophin- deficient muscle. “Hypercontracted fibers are the earliest morphological abnormality of DMD and were ascribed to persistently raised intracellular calcium ions.” In a study conducted by David Allen et al. 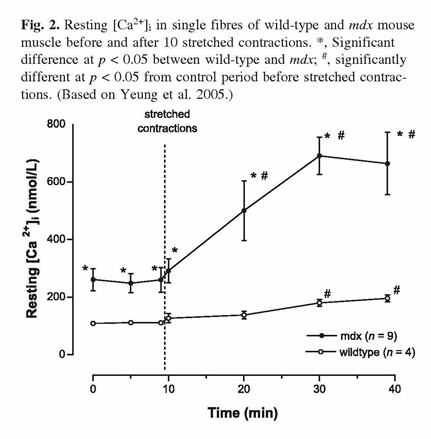 evidence was found that a series of stretched contractions of mdx muscle fibres causes a prolonged increase in resting intracellular calcium concentration ([Ca2+]i). The rise in [Ca2+]i is caused by Ca2+ entry through a class of stretch-activated channels (SACNSC) for which one candidate gene is TRPC1. Proteolysis is the degradation of proteins by the enzyme protease. “Protein degradation rates in isolated normal muscle (as assessed by tyrosine release) can be raised or lowered by manipulations that raise or lower [Ca2+]i.” Turner et al. 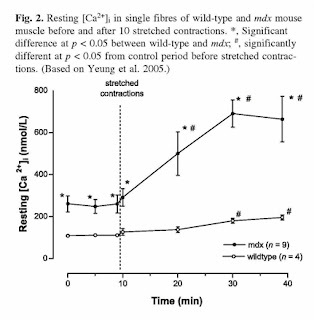 found a raised [Ca2+]i in mdx myofibers and therefore studied tyrosine release rates in isolated mdx muscle. Proteolysis occurred 80% faster than in normal muscle, but this difference could be abolished by lower extracellular calcium concentrations (and perhaps therefore normalizing [Ca2+]i). This result was subsequently confirmed, and the effect was shown to be blocked by leupeptin (a thiol protease inhibitor). These are not the results that would have been expected if the abnormalities of calcium influx were a direct result of dystrophin deficiency. An alternative hypothesis was therefore put forward in which transient membrane ruptures allow an influx of calcium. This then causes local activation of proteases which modify calcium leak channels to cause further calcium ingress. Thus a vicious circle might be established in which calcium homeostasis becomes deranged. The mechanism of action of corticosteroids in DMD is unclear. However, the excretion of creatinine is increased and that of 3-methylhistidine, a marker of muscle breakdown, is decreased in DMD patients treated with prednisone (Ames, W.A., Hayes, J.A., & Crawford M.W., 2005). Corticosteroids also increase insulin-like growth factor I (ILGF-I) levels in DMD, thereby promoting repair and regeneration of skeletal muscle cells. “In dystrophin-deficient mice, corticosteroids inhibit calcium influx into damaged myocytes and promote myogenesis (formation of muscular tissue)” (Ames, W.A., Hayes, J.A., & Crawford M.W., 2005). These findings suggest that corticosteroids may increase muscle mass by decreasing protein breakdown in DMD. 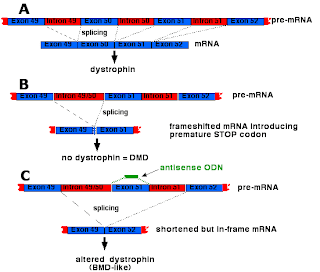 Overall, symptoms and implications of muscular dystrophy all stem from a mutation in the dystrophin gene. It is known that dystrophin is an absolute requirement for normal muscle function; however, its exact role is unknown. Although dystrophin is clearly required to maintain the structural integrity of the muscle fiber, how this is achieved remains unresolved. Perhaps one day the unknowns regarding this disease will become known and the fight to end muscular dystrophy will prevail. Allen, D. G., Gervasio, O. L., Yeung, E. W., & Whitehead, N. P. (2010). Calcium and the damage pathways in muscular dystrophy. Canadian Journal Of Physiology & Pharmacology, 88(2), 83-91. 721. 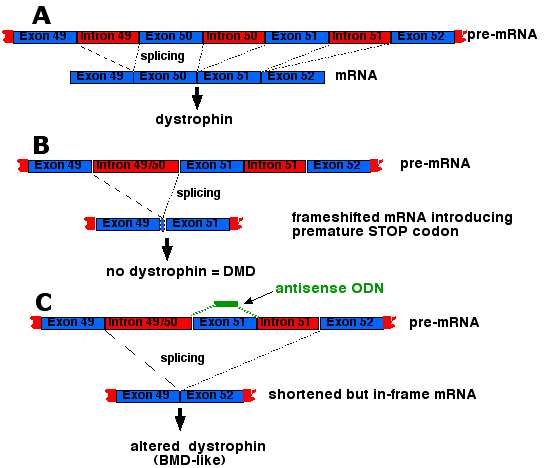 Antisense Oligonucleotide Therapy for Duchenne Muscular Dystrophy: From Cell Culture to Clinical Trial. I was interested to learn more about the research involved in finding the cure for this disease. I was curious about the use of Corticosteroids and how they can affect the bone structure? you mention creatine is released to reduce muscle breakdown, is this similar to creatine used by body builders? I really enjoyed this blog post and it was also relevant to me because I also know someone affected by Muscular Dystrophy. I couldn't believe that a disorder that serious could be caused by something as small as a deletion mutation to the gene coding for the dystrophin protein. I also found it interesting that the most frequently prescribed medication, corticosteroids, help with delay of the disorder but also weaken bones. This explains why people with Muscular Dystrophy have to be so careful in doing what they do. 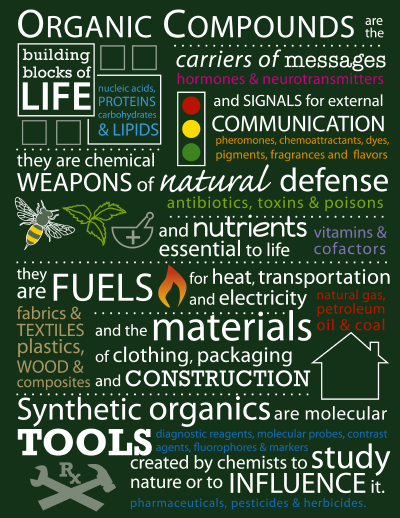 It also makes me wonder that if we are studying animals with the disorder if there will eventually be a cure and some way to substitute the dystrophin protein with a synthetic drug or molecular therapy of some sort. Overall, great blog post!